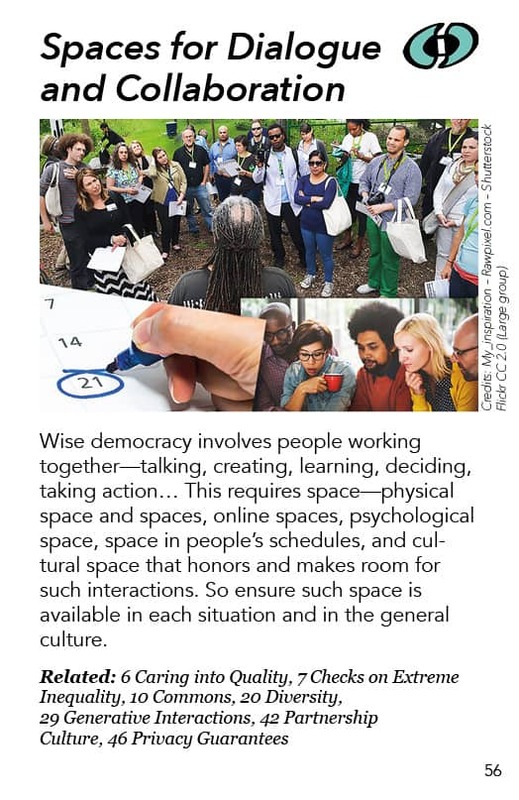 Wise democracy involves people working together—talking, creating, learning, deciding, taking action… This requires space—physical space and spaces, online spaces, psychological space, space in people’s schedules, and cultural space that honors and makes room for such interactions. So ensure such space is available in each situation and in the general culture. This pattern is sort of self-evident, except it is often overlooked, and it’s been vivid for those of us who are trying to bring people together in the community, only to find out that there are not so many spaces available for people to come together in, to talk and to work together. Very often there isn’t the right kind of space. Conveners who want to do the process World Café need to access spaces where there can be lots of little tables with 4 to 5 people around them. Conveners who you want to do Open Space have to have spaces where people can gather in side rooms or other designated spaces for sub-conversations. And, in general, we want to have space niches in the community for people to just be able to stop and talk. Cafes have that, park benches provide that. So having that kind of space accessible helps. This is relevant for wise democracy, because you’re trying to have people engaging together in creative ways. You need space for that. You also need online spaces. People are busily creating online spaces that have capacities for very different kinds of conversation to happen online and that is still an ongoing and rapidly developing trend. People are asking what kinds of conversation are difficult, or hard, or easy online? Some people are making new software that allows new kinds of forums to be built, to do different things online together. That whole world is part of creating “spaces for dialogue and collaboration”. Psychological space is another kind of space we need. If you are pushing people into focusing on their own lives or hating each other, you will not have the psychological space for people to be able to work together. We also want spaces in people’s schedules. If everybody is being overworked, if there’s no help for mothers, if there is no relief for people who are working, you don’t have “spaces for dialogue and collaboration”. The children are scheduled from morning to evening, and there’s no real time for people to stop and have conversations that make a difference, to say nothing of organized conversations to make some political progress together in the community. So space-and-time is another kind of “space”, often taking the form of “events”. Underlying all this (and easily taken for granted) is having the ability and right to meet in groups larger than two – commonly known as freedom of assembly. This includes the freedom to use public spaces. So having a culture that says this is really important, is key to make space for conversations and collaborations. The Dalai Lama talks about “a culture of dialogue”. I think that’s a big part of the way we relate to each other, to honor that and to provide the resources for that. A wise democratic system would prioritize the provision of all those different kind of spaces. 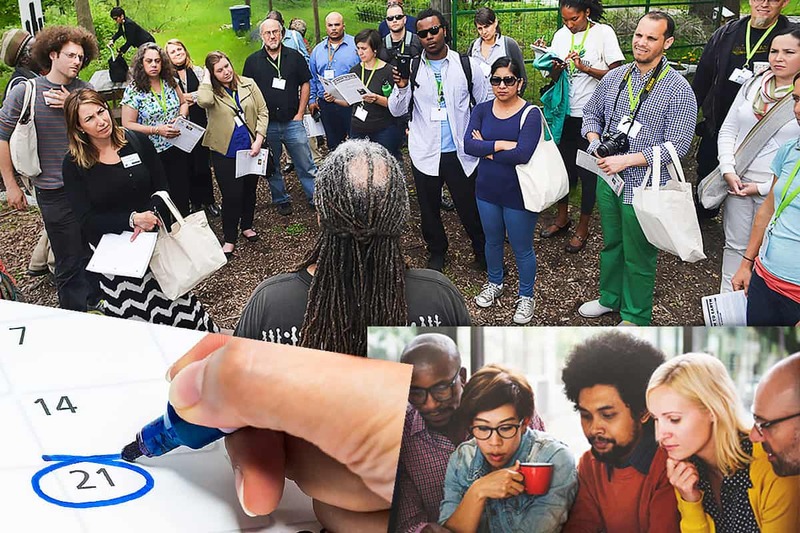 Intentional community is a kind of space for dialogue and collaboration. Co-housing is interesting: it mixes your own personal or family space with common spaces. Online sharing and gifting sites are spaces in which we actually share things and exchange things. Libraries very often have spaces for people to have meetings; churches and local groups provide space too. We have an “Aging in Community” network that meets in a room free of charge in a mental health center once a month. Very often there are issues of money, having to pay for space to meet. That is problematic for many people: particularly, the more grassroots the gathering is, the more problematic it becomes. So having a hotel in the conference center where you pay $5000 per day is not the same as having a “space for dialogue and collaboration” – at least in the wise democracy sense. In some areas, when a school closes, you can go and use the classrooms. I stumbled on a thing called spacious.com. Restaurants in New York open for dinner at 5 o’clock. So this group called “Spacious” has an arrangement with the restaurants. People can come and rent individual or collective workspace in the hours prior to the restaurant opening. When the restaurant is closed, staff from Spacious makes sure there is coffee available, and then when the restaurant opens, lots of people who were working in the spaces of the restaurant stay for dinner. So it is a win-win. This is interesting: you have spaces that are closed off – like after-hour schools and before-opening restaurants – and you open them up. Existing spaces are opened up either for-profit or by the community decision for the community.